When Leonardo da Vinci set out to paint his famous portrait, the Mona Lisa, he took much time to consider the most appropriate background. The scenery had to enhance her physical beauty, not overwhelm it, and it had to evoke the viewer’s idea of paradise. His solution was to paint the landscape dearest to his heart, the land of his birth: Tuscany. Tuscany’s epic beauty is what dreams are made of—sun-drenched farmhouses, beautifully curved hills, romantic vineyards lost in the rolling countryside—it’s a land that straddles the fence that divides reality from imagination. It’s been said that the beauty of Tuscany, the land of ruby nectar, reaches its maximum form of expression in a glass of red wine, but due to Tuscany’s complex history and civilization, Tuscan cuisine has also scaled culinary heights. Much like it’s landscape, Tuscany’s food is often clean, rustic and simple. Meals come together with a savvy mix of vegetables, beans, bread, a good dose of golden olive oil, and favorite aromatics—thyme, rosemary, and fennel. Ribollita, a famous Tuscan soup, is a perfect example. 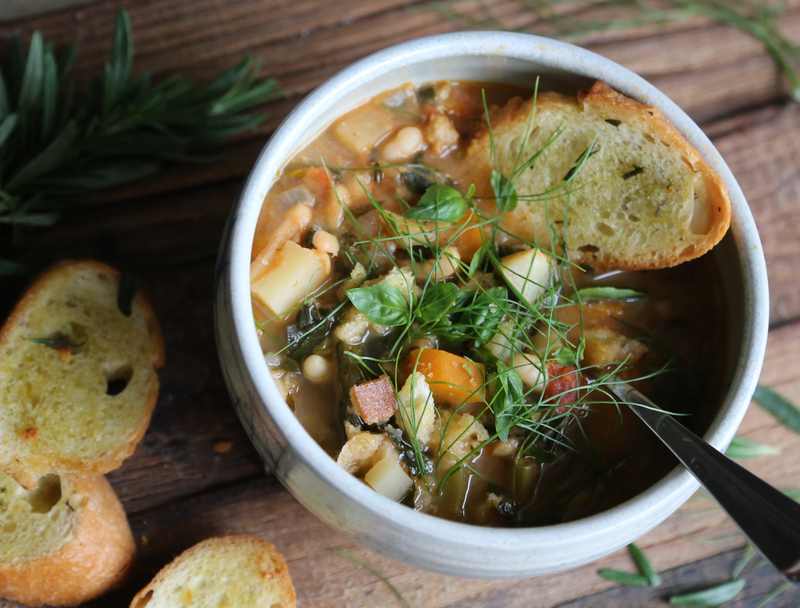 Made with vegetables, fresh herbs and bread, this rustic soup is gently simmered so the flavors meld together beautifully. An icon of Tuscan cuisine, ribollita literally means “reboiled.” The soup has its origins in the Middle Ages when servants would gather food-soaked bread from their lords’ tables and boil them with vegetables and herbs for their own food. The following day, the soup was reheated (reboiled) and was found to be even more flavorful. Since then, the dish has evolved from peasant food to high-end Italian cuisine, but the ingredients haven’t changed too much. Although there are as many ways to make ribollita as there are cooks, all versions include onions, carrots, celery, white beans, cavolo nero (Tuscan kale or Lacinato kale), olive oil and Tuscan bread. When it’s chilly outside, this thick and hearty vegetable stew is a satisfying way to warm and fill you and can easily become the trend for winter’s coldest months. In a large pot, sauté onion in oil for a minute or so, then add leek and fennel and sauté for about 5 minutes. Add carrots, celery and potato and sauté until the vegetables have softened a bit, about another 5 minutes. Add tomato paste and stir for 1-2 minutes. Add tomatoes, parsley, basil, thyme, bay leaves, red pepper flakes, kale, 5 cups of broth, and salt and pepper. Bring to a boil, reduce heat and simmer for about 25 minutes. Meanwhile, purée half of your beans with a little water, adding more if necessary to become smooth. Remove bay leaves. Add bean purée and whole beans to the pot. Taste and add salt and pepper. Continue to simmer. Tear bread into chunks. Toss with olive oil, garlic, salt and rosemary leaves. Bake until dry, about 10 minutes. Remove from oven and when cool enough to handle, add them to the soup. Stir well and cook for another 5 minutes. Taste and adjust seasonings. To serve, ladle into bowls and garnish with basil leaves, fennel fronds and a splash of lemon juice. If there’s any soup left over the next day, reheat (reboil) the soup, stirring well to break up the bread slices. The soup should be so thick you could probably stand a fork in it. If desired, add more liquid and serve with a traditional drizzle of golden olive oil. Notes: Ribollita soup can get very thick, especially the following day. If necessary, add more broth to achieve your desired consistency. Ribollita is traditionally made with cannellini, a white kidney bean, but other white beans are also acceptable. As I had a lot of flageolet beans on hand, I used them instead. Although you can use canned beans, I would highly recommend using dry beans instead. To make ribollita with dry beans, first soak the beans overnight in plenty of cool water, then drain, cook in plenty of fresh water. Keep in mind that 1¼ cups of dried beans will yield about 3 cups of cooked beans. I used toasted Tuscan bread in the soup and served the soup with garlicky, rosemary toasted baguette slices. Tuscan bread is available in many cities, but if you cannot find it, substitute with any dense, crusty bread. Oh my goodness. I am going to make your ribollita. I posted a ribollita today too. It’s such a perfect one pot meal isn’t it? Yours is fabulous! Hi Seana, thanks! 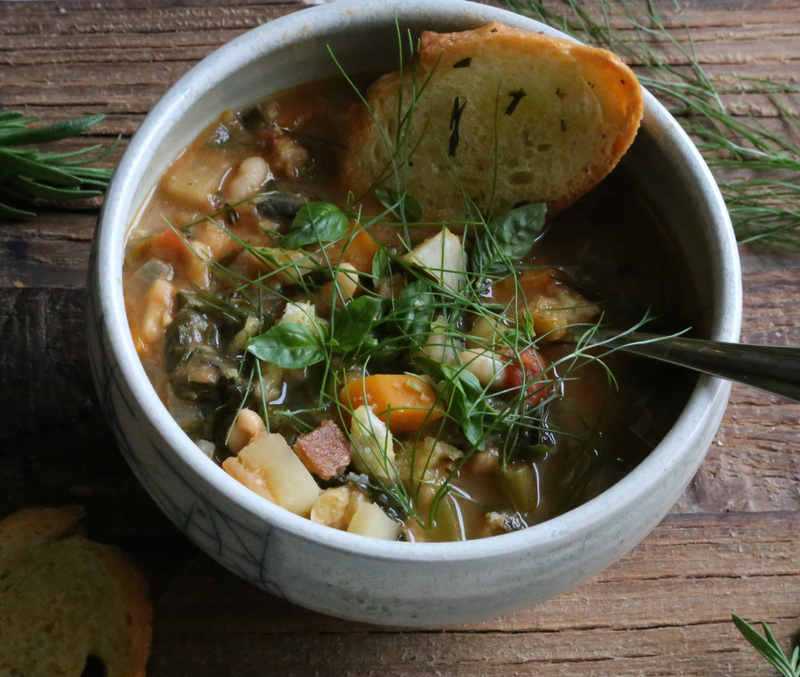 What a cool coincidence that you too posted a recipe for ribollita today! I agree, ribollita is a great one pot meal! My family and I love it, so simple yet flavorful. I’m heading over to check out yours now!